“This is the soul of Buenos Aires,” the cab driver assured me in his heavily Italian-accented Spanish, “…the heart of Argentina.” Out of metaphors, he stopped the cab at Calle Defensa in the old San Telmo district of Buenos Aires, and I ventured down the street into the brilliant Sunday afternoon sunshine. And the driver had a point. The city of Buenos Aires enjoys the well-deserved reputation of being the “Paris of South America” and is clearly a world apart from most anything else you’ll see on this continent. 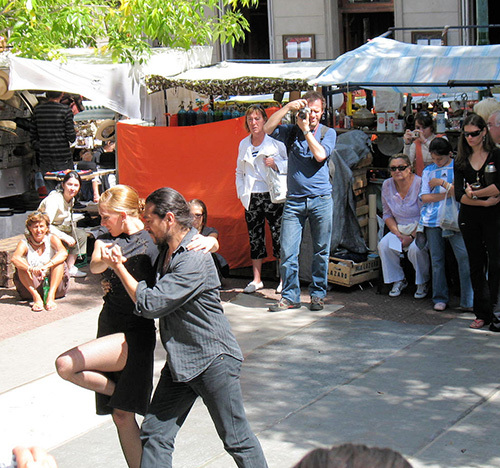 Rich in culture, the arts, and history, Buenos Aires is a gem, offering endless fine dining, excellent wines, theater, and, of course, tango. Buenos Aires is easily the most European city in South America but has its own strong identity, with over 450 years of history and culture behind it. It enjoys four distinct seasons but has no extreme weather and no ice or snow. Health care is excellent in Buenos Aires. I personally found it on par with U.S. standards… except for the price, which was less than one-quarter of what I paid in the United States. If you sign up for health coverage, a good plan will cost between US$300 and US$500 per month for two people. 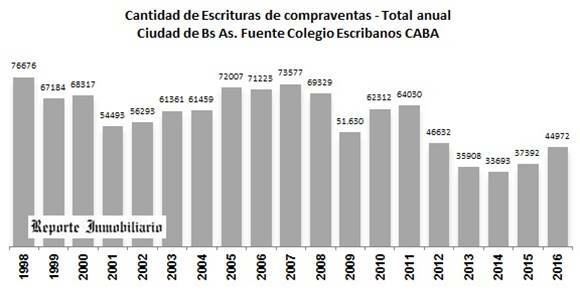 The population in Buenos Aires is generally well-educated, and there’s quite a bit of English spoken. Best of all, the cost of living is very low nowadays. A nice dinner out for two with wine will cost you around US$55. A bottle of great Malbec—Argentina’s signature red wine—runs about seven bucks in the supermarket. If you like a good steak, a pound of their world-famous filet is only US$5.50. Argentina’s last two presidents were an economic nightmare. President Cristina Fernández and her predecessor Néstor Kirchner relied on artificial exchange rates, doctored economic data (especially inflation rates), currency controls, price controls, and high export taxes in an effort to avoid a complete economic collapse. But things changed in 2015 when Mauricio Macri—a center-right former mayor of Buenos Aires—won the presidential election. I believe he’s turned the ship. President Macri eliminated the export tariffs on wheat, corn, and beef, while reducing the tariff on soybeans. The Argentine peso was devalued by 30% to an honest, true-value exchange rate. He also eliminated the Fernández-era currency controls. And, most importantly, President Macri settled Argentina’s outstanding debt from their 2001 default, opening Argentina back up to capital markets. So, frankly, it was hard to recommend Argentina as a place to invest prior to 2015… but things are different today. The real estate markets are reacting as buyers return. On the chart below you can see Buenos Aires’ cycle of booms and busts. Note that, since 2015, the market has been on an upswing. 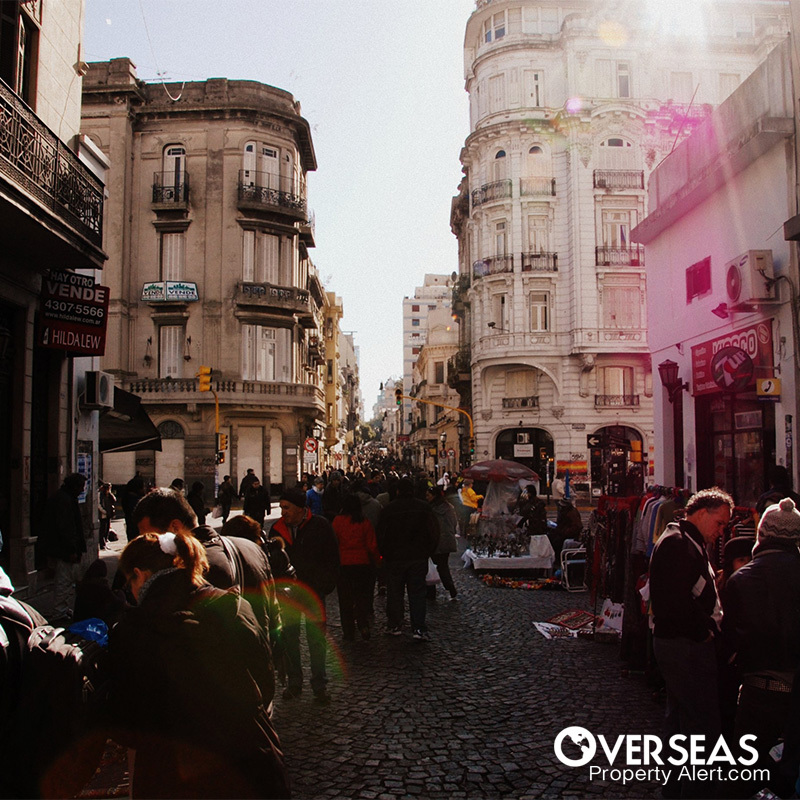 The oldest neighborhood in Buenos Aires, San Telmo, is not the “nicest” part of the city… in the same way that Greenwich Village is not the “nicest” part of New York. 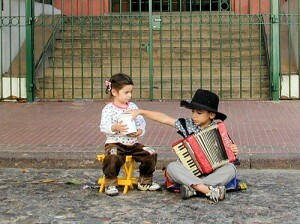 But people love to be in San Telmo for many of the same reasons that they come to the Village. Although its original settlers were immigrant dockworkers, San Telmo now has a working-class, bohemian feel and is the home to many an artist, poet, student, and artisan craftsman. 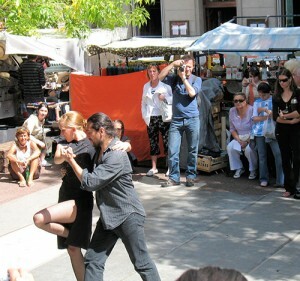 At the center of San Telmo is Plaza Dorrego, one of the oldest public squares in Buenos Aires, dating back to the 1700s. The square was initially a “parking area” for the horse-drawn wagons that brought produce into the city. In the 1800s, Plaza Dorrego became a public square, with the bars, restaurants, and coffee shops showing up later in the 1930s. It was then that San Telmo gained its reputation as an area known for wine, song, and dance… a distinction that remains intact today. As you explore the narrow streets, you’ll enjoy the sound of tango as young couples dance in the open air to musicians playing the music that’s become a national treasure. You’ll also see mimes, singers, and street performers of all types. Artisans are out in force on Sunday, and all of the restaurants, cafés, and shops are busy with locals and tourists alike. Plaza Dorrego hosts a weekly, outdoor market that draws visitors from all over the city and the region. This famous antique market (officially called the Feria de San Pedro Telmo) began in 1970, and now has over 250 stalls offering antiques, jewelry, old books, handicraft items, and all sorts of knickknacks… including a great collection of restored gramophones and Victrolas. The market—along with more than 200 other area antique shops—has given the zone the reputation of being the most prominent antique center in all of Latin America. With San Telmo drawing estimated Sunday crowds of over 10,000, it will be apparent why downtown Buenos Aires seems so deserted that day. Many people assume that Buenos Aires is unaffordable, but the properties can be reasonable in San Telmo. Actually, they’re a great value when you consider the caliber of the city. The homes listed below are all in move-in condition. In an excellent location near Plaza Dorrego, I found a stylish older building from the 1950’s with an apartment on offer. The attractive building is small, with six floors and two apartments per floor, and the listed 76-square-meter (818-square-foot) unit includes two bedrooms, a single bathroom, living room, and kitchen—all original and in good condition. The asking price is only US$115,000. On Paseo Colón, there’s an 85-square-meter (915-square-foot) apartment available on the 19th floor with two bedrooms, two bathrooms, and amazing San Telmo views from the balcony, living room, and master bedroom. The floors are parquet and the maid’s quarters can be used as a third bedroom or study. It comes with central heating and hot water, as well as 24-hour security. The asking price is US$165,000, with a garage space available for purchase for US$25,000. 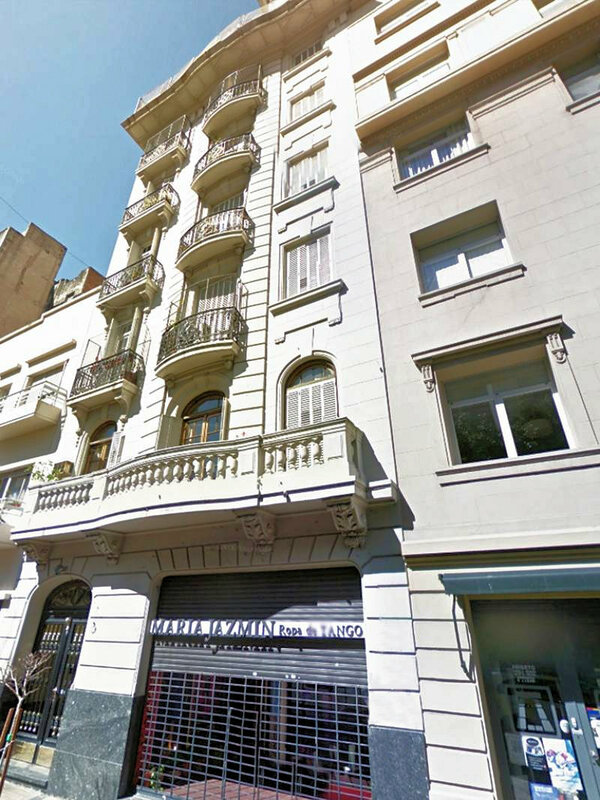 A somewhat larger apartment on Avenida Salta is on the market, with 130 square meters (1,399 square feet) of living area including an entrance hall, three bedrooms, service quarters with separate entrance, and a laundry room. The living room has a fireplace and the floors are wood parquet, all for the asking price of US$269,000. If you’re buying a property with capital gains in mind, you’ll be glad to hear that there’s no capital gains tax in Argentina. Is San Telmo For You? 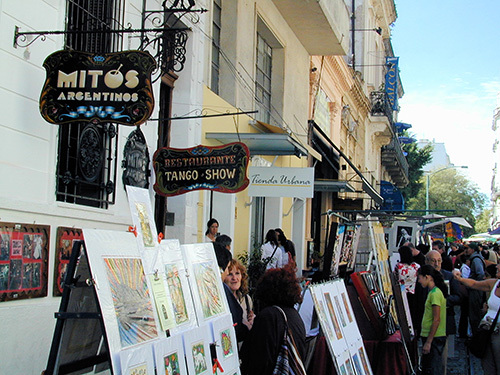 San Telmo is a Buenos Aires classic… one that you don’t hear much about. Most investors are attracted to the premium neighborhoods of Recoleta, Palermo, and Puerto Madero… and if investment were your one-and-only criteria, then they indeed may be the best bet. But if you’re going to spend time in your Buenos Aires property, I’d be sure to have a look at San Telmo. It has character that will be hard to find anywhere else… not to mention the potential for good rental returns. Our primary real estate contact there for many years is Buenos Aires-native Paul Reynolds, who has one of the city’s largest real estate companies. (He and his staff speak excellent English.) You can contact him here. I’m enjoying your articles here in the USA. I’m retiring soon, and heading to Mazatlán. Would you give me a few pointers or a few contacts/groups that would help a new expat and wife get settled in? If you haven’t read it yet, here’s an article where I analyze why I chose to live where I did in Mazatlán. The article also links to a series of previous articles I wrote on Mazatlán. To get familiar with the expat scene, try one of the online, expat newspapers—in English. Once you get there, you can get hard copies as well. These will give you a feel for who’s who and for the events that are now going on in the off-season. The furnished rental is a good idea, to help determine where you want to live. I rented in a building called Vue Centro Histórico, which is on the ocean, but within walking distance of the historic center. But there are dozens of good options… To find a furnished rental (or to look at real estate) contact my friend Gregory here.